Elite Boxing is set to take a major step into an exciting new market on August 8 when it is scheduled to host its first ever EFN event on Chinese soil. 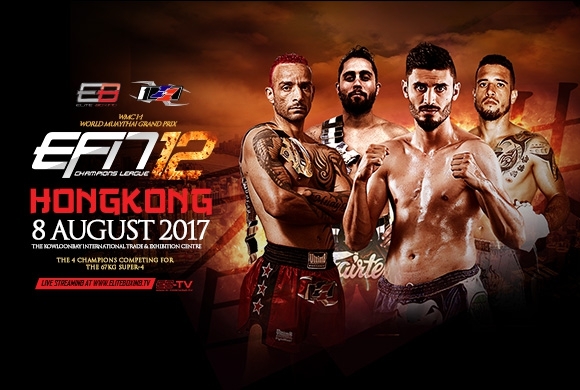 The second of four qualifiers for the Kings Memorial Cup 2017, EFN 12 will take place in Hong Kong under a collaboration with famous promoter Master Kim Ip. Featuring a 4-man 66kg tournament with the aim of identifying the second finalist of the Kings Memorial Cup on December 5, EFN 12 will be incorporated into an action-packed fightcard that will include 6 exhibition superfights as well as a 4-man I-1 tournament organized by local promoter and long-time EB ally, Kim Ip. The four fighters taking part in EFN 12 are Alex Oller of Brazil, Cedric D of France, Umut Norgas of Turkey, and Pumip C of New Zealand. Also on the fightcard is lgendary Thai fighter Madsua, who gained widespread fame by winning the Challenger reality TV show. Madsua is now based in Hong Kong and also recently won his most recent fight during EFN 10/11 in Malaysia on July 28. While the winner of the 4-man EFN tournament will qualify for the Kings Memorial Cup, the winner of the 67kg I-1 World Title Super-4 Championship will not only receive the WMC I-1 World Title, but will also be awarded the WMC EFN Kings Cup title. Although this is the first time EB and Ip have jointly-organized a tournament, the two have a long-term working relationship with EB regularly streaming Ip's I-1 events on its EB-TV platform. The collaboration is set to benefit both parties as it offers EB a foothold in the Chinese market while for I-1, it creates wider global recognition and the chance for its fighters to compete on an international stage.